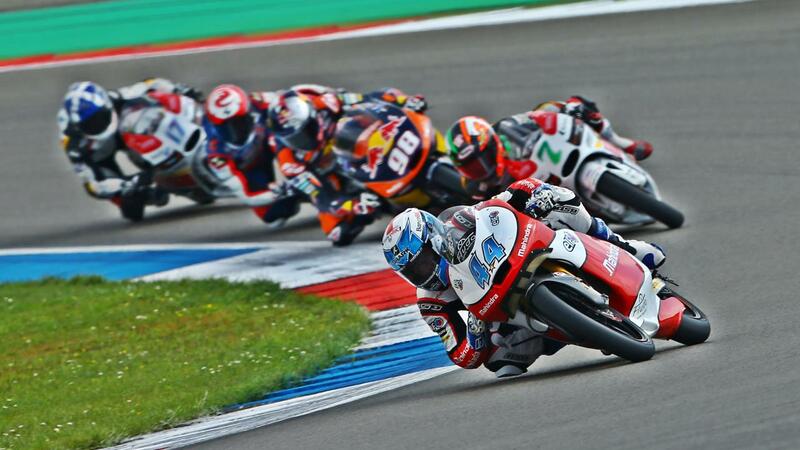 Mahindra MGP3O rider Miguel Oliveira finished a fine third in today’s Dutch TT, taking a first podium of the season for the only Indian manufacturer in international motorcycle racing after a strong ride from 13th on the grid. The Portuguese teenager picked his way through a big group of Moto3 rivals disputing third place, taking control on the sixth of 22 laps of the 4.54-km classic Assen circuit, nicknamed “the Cathedral of Racing”, and then moving clear. Now the chase was on: his next rival was second-placed Alex Rins (Honda), and the gap was 2.5 seconds. The Assen crowd were treated to a display of remorseless speed, as Oliveira closed steadily on his Spanish rival. By the 16th lap he was on his tail, and moved directly past. From there it was a game of cat-and-mouse, with Rins following the white-and-red Mahindra closely, looking for parts of the track where he might be able to return the attack. It happened on the way into the final chicane for the last time, where Rins outbraked Oliveira to lead him over the line by just over half a second. It was the best result of the year for Mahindra, and a repeat of the same rider’s first MGP3O rostrum in Malaysia last year. In a season where the overall technical standard has risen, it is further proof of the growing maturity and strengthening challenge of the purpose-built Mahindra MGP3O Moto3 racing machine. Second rider Arthur Sissis finished a disappointed 21st, after suffering handling issues that saw him drop back from a strong start. Brad Binder was ninth on a customer Mahindra, with Matteo Ferrari placing 13th to put a third Mahindra in the points. The race was won by Rins’s team-mate Alex Marquez. The next round is the German GP at the Sachsenring in two weeks.